The end of winter break can’t be soon enough. You’re cooped up in the house with tired children. In the movie Frozen, Elsa was also cooped up. You’d love to send your kids out to build a snowman. But there’s one problem. There’s no snow. Fret no longer. 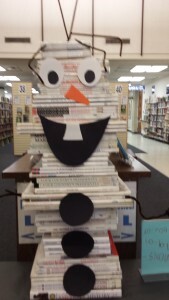 Your school age kids can create an endearing Olaf snowman . . . without snow. 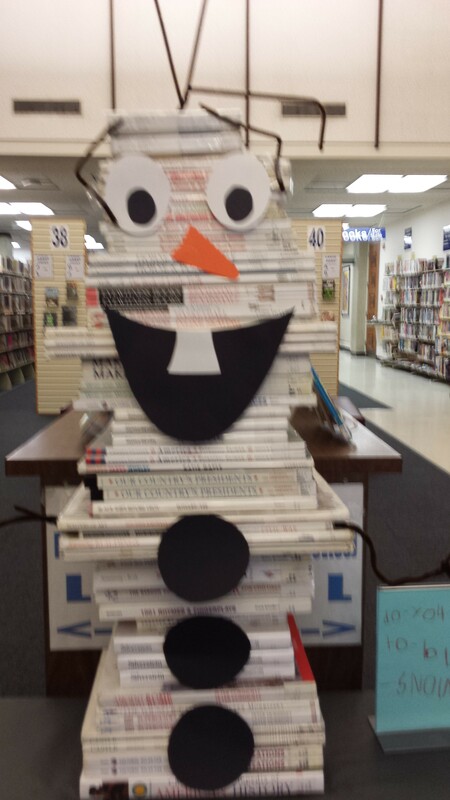 The Stanislaus Country Library featured this delightful “snowman” that’s simple to build. Send the kids on a scavenger hunt to gather items they’ll need. For pre-readers, suggest they gather five books they’d like you to read to them over break. About 30 hardcover books. The library staff chose books with predominantly white spines, but they probably have a larger selection than you do! School-age children can fairly simply create their own unique Olaf. Then read a favorite story snuggled in blankets with their new friend, Olaf. And don’t forget to take a photo and send it to me to post. Do You Want to Build a Snowman? by Kristen Bell for movie Frozen. www.disneyclips.com/lyrics/frozenlyrics2.html. Accessed 12/30/2015. Personal photo taken at Stanislaus County Library on December 22, 2015.